The Bicycle is the most environmentally friendly and quite popular mode of transport. Its main advantage – portability. But like other vehicles, bicycles are subject to wear of its constituent parts. 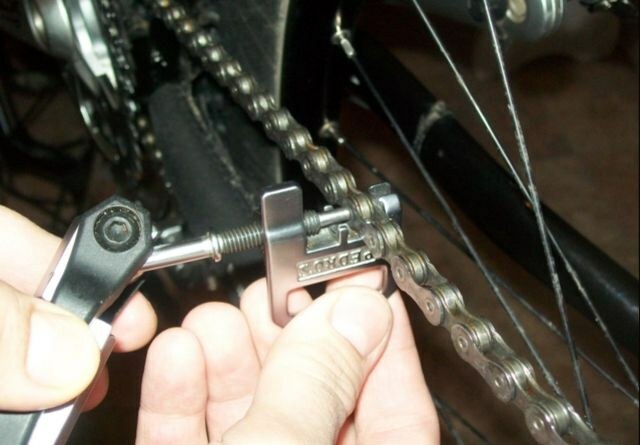 A Bicycle chain is slipping mainly due to insufficient tension. The bike is equipped with a special tensioner, the process of tightening is automatic. However, the chain on these bikes to fly off due to a malfunction of the shift mechanism. Try to change the cable on the switch. If that doesn't work, replace the switch completely. On older models the chain is tensioned manually. Loosen the rear wheel and pull it, adjusting the position of the wheel. Pull too much and is not worth the circuit in operating a bike may break. After completion of this procedure, as it should grease it. This will prolong the "life" of a chain mechanism. Another reason for the falling chain is the deformation of the rear wheels. Otherwise the ordinary "eight". It also affects the handling of this vehicle and the quality of braking. Especially such deformation adversely affects the braking mechanism of the rim type. To affect such situation, try to tighten the spokes. They should be tighten until until they are all tensioned the same. When properly managed, all the spokes when you hit him, should produce the same sound. If this procedure did not help and the wheel rim straightened, it is best to replace the wheel on new. The next cause that is close to the previous one, is a deformity of the main swanky, which is on the pedal. Remove the pedal and try to straighten it. To do this, put it on a hard, preferably metal surface and hit with a hammer on the curvatures. The difficulty is that this zvenku cannot be separated from the pedal. But this factor only complicates the recovery process, not make it impossible. A fault in the drum brakes can serve as another reason influencing the decay chain. The thing is the bearings. When severe wear, the bike starts to "profilati" and that without end falls off the chain. To get rid of this problem, remove the rear wheel and remove the carriage. To do this, on the one hand, Unscrew the nut, and with the other remove the snap ring. After you collect all the remains of the old bearing and put new one. Before you set the caret back, heavily grease it and the inside drum of the wheel. As the lubricating substances are very well suited "Litol". It retains its lubricating properties for a long time even with heavy use vehicle.